Father John Misty has delivered the video for Pure Comedy single “Total Entertainment Forever” — the one with the controversial Taylor Swift lyric — and as with the song itself, there’s a lot to unpack. 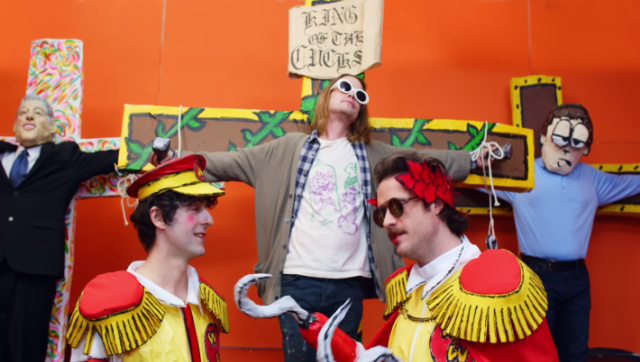 In keeping with the lyrical themes about our culture losing itself inside of endless stimulation, the Adam Green-directed clip stars Macaulay Culkin as Kurt Cobain stumbling through something like Christ’s crucifixion in the context of a Pee Wee’s Playhouse-like video game. Josh Tillman oversees the proceedings while dressed as some sort of maniacal Captain Hook/Ronald McDonald figure. Bill Clinton shows up to play saxophone before joining the King Of The Cucks on a cross. There’s much more happening here, so just watch below and let’s try to make sense of it together. Pure Comedy is out now on Sub Pop. Read our premie evie. UPDATE: In addition to director Green, of Moldy Peaches fame, the cast includes Tei Shi — subject of a recent Stereogum Q&A — and two members of recent Album Of The Week honorees Charly Bliss, Spencer Fox and Dan Shure. 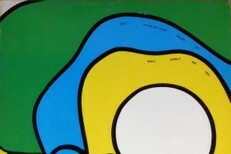 Keep all that in mind for your next indie rock Kevin Bacon game.